Paper prepared to the conference on "Moving towards the European Report on Development 2009"
Sherriff, A. and Faria F. 2009. 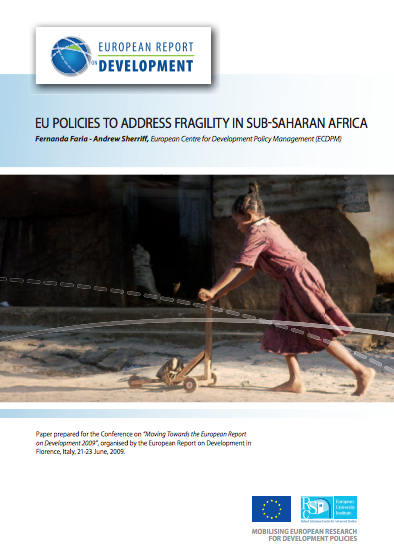 EU policies to address fragility in sub-saharan Africa. ECDPM Paper prepared to the conference on "Moving towards the European Report on Development 2009", organised by the European Report on Development, 21-23 June 2009. Maastricht: ECDPM. Concern over fragility in Sub-Saharan Africa and elsewhere is not new to the European Union, but, in the last few years, policy awareness and efforts to improve the EU policy framework, to adapt its tools, and to promote better coherence and co-ordination have multiplied. While expectations should always be modest, given the primacy of local actors in addressing fragility, the EU’s wide range of policies and tools, which go beyond development, make it a highly-relevant actor to respond to fragility. There has been some progress to adapt EU policies and tools to the specific and heterogeneous contexts of fragile states. The EU is also committed to international agendas on aid effectiveness and good international engagement in fragile states and situations. The implementation record is, however, weak. EU policies and commitments have not yet been genuinely “field-tested”. Consequently, the solution may not be found in the development of more policy unless more fundamental issues are addressed. Questions remain as to whether the EU can overcome the considerable political, financial and institutional challenges to bridge the gap between the policy prescriptions and practice. There are also questions as to whether the EU has the effective knowledge, experience and capacity at country and regional levels to address fragility, and to what extent it is willing to engage with more diverse actors at these levels. A lack of commitment to a genuine “all-EU” political strategy, in addition to the absence of operational guidance on how to deal with particularly complex and thorny issues in fragile states – for example, governance, the link between peace-building and state-building, a more inclusive interpretation of the ownership and partnerships concepts beyond the ruling élites – are among the key issues that limit both the EU’s role and ability to make better use of its potential in these situations. The concept of fragile states may not have much operational utility, but the debate does highlight the scope of the challenges and the difficulties of EU and other international actors’ policies in transforming failed states. If the EU, or, for that matter, any donor, is unable to live up to their own policy rhetoric, questions should be asked about where the term “failed” most appropriately lies – with states in Sub-Saharan Africa or in reference to donors themselves.